Two posts today, looks like wildcard weather is really settling in. 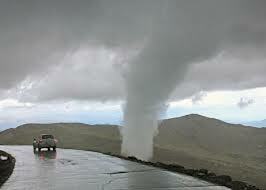 On Saturday an EF-0 tornado touched down on Mount Evans, CO, which is about 60 miles west of Denver. Now it was July, so another EF-o tornado shouldn’t be big news. Except the elevation at Mount Evans is 11,900 feet, almost two miles in altitude! That makes Saturday’s twister the second highest tornado on record. So why is it so rare that tornadoes occur at higher elevations? Is it because uneven terrain and obstructions disrupt tornado air flow and destroy them? Absolutely not, and that is a complete myth. The reason is water vapor. Water vapor is key to the formation thunderstorm formation. It’s the condensation of water vapor into liquid droplets that provides the heat energy needed for a thunderstorm. Without a sufficient amount of moisture it doesn’t matter what other conditions exist. As far as that pertains to altitude, atmospheric water vapor levels drop drastically with height. As temperature and pressure decreases with height, the air can hold a lot less moisture. That means there’s a lot less energy available for thunderstorms at Mount Evans than Denver, and a lot less at Denver than Mobile, AL. That makes Saturday’s twister a rare occurrence indeed. I guess this summer we’ll just have to take tornadoes wherever we can get them. The Mount Evans tornado, taken Saturday, July 28, 2012. Included in the article below (from weather.com) is a video with Dr. Greg Forbes. It’s a good, quick watch and includes the 5 highest tornadoes ever recorded in the United States. The article also touches on the record low tornado count for July. In fact, Canada saw more tornadoes in July than the US! ← The Western US and a century of drought; welcome to the new normal. As this blog evolves I realize it will be difficult sometimes to decide just how much science should go into each post. If you would like me to get into more detail about any point I make please just ask.